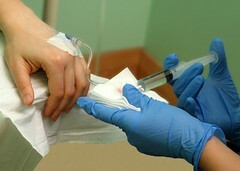 This is how the chemo goes in, well this one here is actually the anti-sickness drug going in. For the first type there was a saline drip and the drugs are injected in through a t-piece along with the saline. The second type Taxotere is hooked up on a drip and takes about an hour or so to drip in.